The Healthy Minds | Healthy Campuses initiative has gone through many different stages as it continues to grow and develop. Scroll through our interactive timeline to learn more about our history and key highlights that have contributed to our vibrant community of practice. A strong need is identified in BC for an initiative that helps promote mental health on campus and reduces risky substance use. The 2004 Canadian Campus Survey by the Centre for Addiction and Mental Health showed that 30% of undergraduate Canadian students experienced mental illness and 32% of undergraduates participated in hazardous drinking. The “BC Campus Project” was formed with the initial phase of the Campus Project focused on relationship-building between the campuses and the BC Partners, as well as within the campus community. 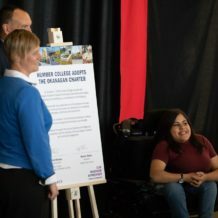 Four post-secondary institutions joined the “BC Campus Project”: Douglas College, Thompson Rivers University, University of Northern BC, and University of Victoria. 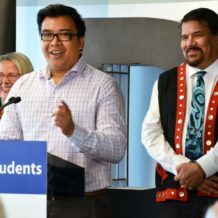 Four additional campuses joined the initiative: BC Institute of Technology, Selkirk College, Simon Fraser University, and Vancouver Community College. The Initiative officially became a Community of Practice after a two-day workshop facilitated by Dr. Etienne Wegner on Creating Campus Communities of Practice resonated with current members and the 50+ participants. Fifteen post-secondary institutions are actively engaged with the Community of Practice. The inaugural provincial Healthy Minds | Healthy Campuses Summit is held in Victoria, BC. The second annual Healthy Minds | Healthy Campuses Summit is held in Coquitlam, BC. The third annual Healthy Minds | Healthy Campuses Summit, “It Takes a Whole Campus”, is held at the Justice Institute of British Columbia in New Westminster, BC. The fourth annual Healthy Minds | Healthy Campuses Summit, “Revolutionizing Campus Wellness: A Vision for Healthy Campus Communities” is held in Victoria, BC. The Minister of Health announces funding for the Changing the Culture of Substance Use Project during opening remarks at the 2012 Summit. “Suicide Prevention On Campus: Expanding the Possibilities“, by Dr. Jennifer White. 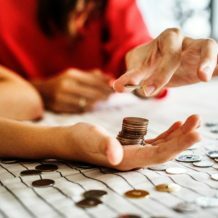 Campus Capacity Development Grants are announced to support BC post-secondary institutions in building capacity and encouraging innovation in campus mental health promotion and the reduction of risky substance use. In early 2013, six Phase I campuses join the Changing the Culture of Substance Use Project and engage in needs assessments and consultations. Campus representatives attend project launch retreat focused on capacity building, knowledge exchange, outcome planning and network development. “Post-Secondary Student Mental Health: Guide to a Systemic Approach“, a national resource, launches. The interactive “Designing Healthy Campus Communities” video launches. 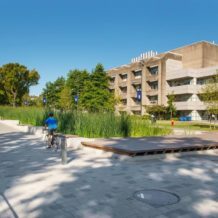 Hosted by Simon Fraser University, “Designing Healthy Campus Communities: Enhancing Student Well-being and Academic Success” explores opportunities to be innovative and strategic in designing healthy campus communities where all students can learn and thrive. Campus Capacity Development Grant Projects, the first in a knowledge exchange webinar series. In fall 2013, five Phase II campuses join the Changing the Culture of Substance Use Project. What does it mean to change a culture? The number of Community of Practice members grows to 24 BC campuses, along with 20+ community organizations. The CCSU pre-Summit is held at the fifth annual Healthy Minds | Healthy Campuses Summit, with over 50 participants from 11 institutions. Over 200 delegates attend the fifth annual Healthy Minds | Healthy Campuses Summit, “From Vision to Action: Implementing a Systemic Approach”, in Vancouver, BC. “Post-Secondary Student Mental Health–What’s the Buzz?“, co-hosted with the Canadian Association of College and Universities Student Services (CACUSS). Appreciative inquiry as an engagement, situational assessment, and planning method: Selkirk College case study. The first in the “Low-Risk Alcohol Use: Balancing Our Thinking Around Drinking” series by the Changing the Culture of Substance Use Project. HM|HC co-hosts “Creating Conditions for Well-being in Learning Environments” with the Centre for Innovation in Campus Mental Health. “Low-Risk Cannabis Use on Campus“, by Tim Dyck and Catriona Remocker from the Centre for Addictions Research of BC (CARBC). Participating CCSU Project campus members convene with provincial stakeholders to promote healthier relationships with substances. 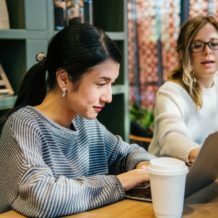 The Social Learning & Launch Event is held in Vancouver, BC, to connect stakeholders and change-makers across BC’s post-secondary institutions. “Mapping a Healthy Post-Secondary Culture: Knowledge Exchange and Strategic Planning for Provincial Group“, the first-ever provincial student event, is held in Vancouver, BC. “Using the Art of Motivation to Create Healthier Campus Communities“, by Catriona Remocker and Sarah Joosse, shares how the art of motivation can be applied to shift culture on campuses in promoting mental health, reducing risky substance use, and strengthening communities. Selkirk College, Simon Fraser University, and Vancouver Island University explore the key ingredients to creating connections and engaging campus community members through food and dialogue in “Using Food & Dialogue to Create Connections“. Two UBC student leaders highlight the role of student advocacy and student-led initiatives in catalyzing change in the post-secondary environment in “Advocacy Strategies for Student Leaders: Navigating Governance Structures and Moving Ideas into Action“. HM|HC co-hosts the International Conference on Health Promoting Universities and Colleges in Kelowna, BC, culminating in the Okanagan Charter. Co-hosted by the Centre for Innovation in Campus Mental Health, “Academic Accommodations for Students with Mental Health Disabilities: Recommendations from an Ontario-wide Research Study” presents findings and recommendations from a three-year research project funded by the Ontario Ministry of Training, Colleges and Universities that was jointly undertaken by researchers at Queen’s University and St. Lawrence College. Part One, with Catriona Remocker, Tim Dyck, and Sarah Joosse, summarizes the residence scan conducted by the Changing the Culture of Substance Use project to inform health promotion strategies and practices in student residence life. Specifically, this series offers insight for residence service personnel on shaping their environment and improving overall campus culture around substance use. Hosted by CMHA BC, CARBC, and Jessie’s Legacy Eating Disorders Prevention Program, “College Life: Food, Drugs & Health” examines the complexities that influence eating and substance use, such as academic pressures, access to food, environment, and mental health. Hosted by CMHA and the Canadian Association of College and University Student Services, and based on the Guide to a Systemic Approach to Post-Secondary Student Mental Health, this first instalment asks campus stakeholders nationwide which common interests, concerns, or hopes for campus mental health bring us together as a community. How we can share and develop best practices, knowledge, and resources, and how do we prioritize them? The second instalment focuses on an emerging topic with the National Campus Mental Health Community of Practice: addressing policy through a well-being lens. The sixth annual Healthy Minds | Healthy Campuses Summit, “Cultivating a Campus Culture of Well-being with Intention: Aligning Policies, Practices and Core Mission”, is held in Vancouver, BC. The final instalment looks to the future of campus mental health, featuring the University of Calgary as a case study and the shift to self-assessment. Long-time community member Robin Higgins is recognized by Healthy Minds | Healthy Campuses and the mental health community. In recognition of World Suicide Prevention Day, Dr. Kathleen Stephany from Douglas College presents “Suicide and the Working Environment” to provide individuals and organizations with practical information on helping someone who is considering suicide. HM|HC presents a concurrent session remotely on “Facilitating Student Mental Health in Higher Education through a Provincial Community of Practice“. In “Getting Started: Assessing readiness and engaging campus partners“, resident expert Jonny Morris reviews what a mental health strategy is, why it’s important, and guides participating campuses through the three essential pillars for creating and maintaining a sustainable mental health framework. In “Planning for Success through Lessons Learned: How to implement a mental health strategy“, University of Alberta facilitator Kevin Friese reviews the roadblocks and opportunities that participating campus members faced during launch and management. The seventh annual Healthy Minds | Healthy Campuses Summit, “Ideas to Action: Strategies for Systemic Changes & Measuring Impact”, is held in Vancouver, BC. HM|HC showcases “A guide to peer support programs on post-secondary campuses” in this webinar that takes participants through the guide step-by-step. Back by popular demand, Dr. Kathleen Stephany from Douglas College presents “Suicide and the Working Environment” to provide individuals, organizations, and campuses with practical information on helping someone who is considering suicide. Leading up to National Addictions Awareness Week, Julie Menten from Roper Greyell LLP and Tonie Beharrell from the Health Sciences Association of British Columbia discuss recent legal decisions and practical tips for anyone in a workplace environment–from employees, to unions, and campus Residence Advisors in “Accommodating Addiction“. In collaboration with AnxietyBC, “Why anxiety matters: Tools to promote healthy living” features Dr. Katherine Martinez of the Vancouver CBT Centre introducing a set of tools designed to reduce anxiety, as well as a free, evidence-based application tool to help address “in the moment” anxiety. In “Creating a Roadmap to a Campus Mental Health Strategy“, Andrew Szeto from the University of Calgary and Chris Balmer from Camosun College share practical principles that can be applied to diverse campus environments and highlight key learnings from their own campus journeys. 12 BC post-secondary campuses and several community stakeholders join the HM|HC Planning Group engagement process to consider the future of HM|HC. “Community Cooking Workshops” is an initiative offered by Simon Fraser University to international students to cultivate an environment and culture that contributes to wellness. Learn how your campus community might host a similar workshop to support cultural adjustment.